Not many composers in the history of Western music have written more than on Requiem setting, and Johann Adolf Hasse may well be unique in having writing two, both in major keys. 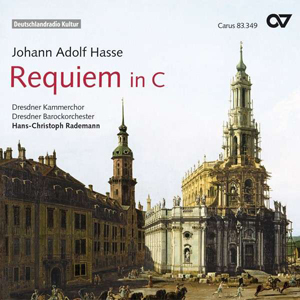 The C major Requiem was written for the funeral of Frederick Augustus II of Saxony, and delivers a paradoxical mix of upbeat state ceremony and reverential mourning. It also mixes the baroque and the classical in a way that makes it very difficult to pin down stylistically. There are traces of Vivaldi here (Hasse studied in Venice) and also of Bach. In fact, the Kyrie, or at least the theme of the Kyrie sounds like it has been ripped off from the B minor mass. But Hasse is his own man, and despite these influences from previous generations, his music must have seemed thoroughly modern and in line with Enlightenment tastes in 1763. Even so, he poses the problem for period performers of exactly in which period to locate his music. Hans-Christoph Rademann and the Dresden Baroque orchestra and choir err on the side of classical elegance rather than baroque erudition. The vocal soloists are given free rein to emote in their various arias, and the woodwind soloists, whom Hasse keeps busy, often sound like they are performing a Mozart symphony. The results are all very elegant, perhaps not as liturgical as the genre requires, but always engaging, and never at odds with the spirit of the music. The tempos are usually quite strict, nothing wrong with that, but they are also often on the slow side. This may have been a conscious decision in order to add the missing solemnity to funereal music that is written in a major key, but the music often lacks momentum. The wind-heavy orchestration could also do with more accentuation. The evenness of the playing certainly shows off the technical skills of the players, but Hasse's music occasionally risks monotony and could do with a helping hand from the performers to keep the interest up. The choir and orchestra are small, and considering the state occasion for which the work was written, I suspect its première was given by considerably larger forces. However, the music has many moments of intimacy, arias, duets and the like, which benefit from the precision available from the small string section. The recording was made in a church, the Ev. St. Marienkircke in Marienberg, and while the resonance is clearly audible, it never overpowers. In fact the size of the ensemble and the size of the space seem ideally matched. The soloists are generally good, giving characterful and attractive performances. One of the female singers (I couldn't identify which) sings with vibrato that stands out like a sore thumb. Also, the bass, Cornelius Uhle is a little underpowered, even against this chamber sized ensemble. The sopranos in the choir have one or two moments of questionable tuning, but on the whole the singing is fine. The orchestral playing is disciplined, almost to a fault. There is no vibrato here, and there is a slight coarseness to the string sound, not unpleasant as such, but at the more extreme end of the period orchestra sound. The second work on the disc is Hasse's Miserere in C minor, and despite his moving to a minor key, the composer is still in a curiously upbeat mood. As with the Requiem, the textures here are fairly homogeneous, with appearances from the solo singers rarer than the choral passages. Perhaps the work is a little more baroque, or at least more contrapuntal, but even in the contrapuntal passages, everything is done with classical panache. The homogeneity of the textures means that there are few opportunities for the audio to pick out details. The microphones are not particularly close to the performers, but the resulting soundscape seems appropriate to the nature of the music. One thing is clear from listening to this recording, that there are many ways to perform the liturgical music of Johann Adolf Hasse, and that this is only one of them. It is a shame that the music is not recorded more often, as it would be interesting to compare this with performance that was faster, or one with a larger ensemble. Even a Karl Richter style modern instrument performance could have its merits, although we may have missed our chance to hear that one. This recording may or may not represent how the work sounded in the 1760s, but it is certainly accordant with the fashions of today when it comes to the early classical repertoire.